The word "transistor" was chosen to describe the function of a three terminal PN junction device that is able to amplify signal. 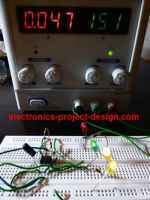 It has a characteristics of "transferring current across resistor". It was invented by Schockley, Bardeen and Brattain at Bell Labs in 1947 and today has revolutionized the way we live. Our microprocessor consists of millions of trans. house in a device called integrated circuit. Trans. work on the principle that certain materials such as silicon, can be made to perform as "solid state" devices. Any material is only conductive in proportion to the number of "free" electrons that are available. Silicon have very few free electron but if "impurities" such as arsenic are introduced in a controlled manner then the free electrons or conductivity is increased. By adding other impurities such as gallium, an electron efficiency or hole is created. As with free electrons, the holes encourage conductivity and the material is called a semi-conductor.Semiconductor material which conducts by free electrons is called n-type material while material which conducts by virtue of electron deficiency is called p-type material. They fall into the category of bipolar trans., either the more common NPN bipolar or the PNP types. There is another type known as a FET which has high input impedance with its characteristics comparable to valves. Modern field effect trans. or FET's include JFETS and MOSFETS. Figure 1 shows the 2 types of trans. which is PNP and NPN types. In PNP type, the emitter is made positive with respect to both the collector and base and the collector is made negative with respect to both the emitter and base in normal operation. It is the reverse for NPN type. A silicon NPN Voltage(base-emitter) needs to be forward biased by about 0.65V for it to turn on. An important characteristics of a trans. is its Beta or current amplification factor which is expressed as HFE(static forward current transfer ratio) or hfe(small signal forward current transfer ratio). Both relates to the grounded emitter configuration. Beta is the ratio of the collector current to its base current, Beta= Ic/Ib. Therefore if the base current of 1mA causes the collector current to rise to 50mA, the beta is 50. Typical junction trans. beta is in the range of 10 to several hundreds. Alpha is the ratio of collector to its emitter current, Alpha = Ic/Ie. It is expressed as HFB(static forward current transfer ratio) or hfb(small signal forward current transfer ratio). The smaller the base current, the closer the collector current comes to equal with the emitter current and the closer alpha comes to equal to 1. Typical value of alpha for junction trans. is between 0.92 and 0.98. The collector current depends on the emitter current and is independent of the collector voltage. The separation between the curves is quite uniform which means that almost distortionless output can be obtained over the useful operating range of the transistor.